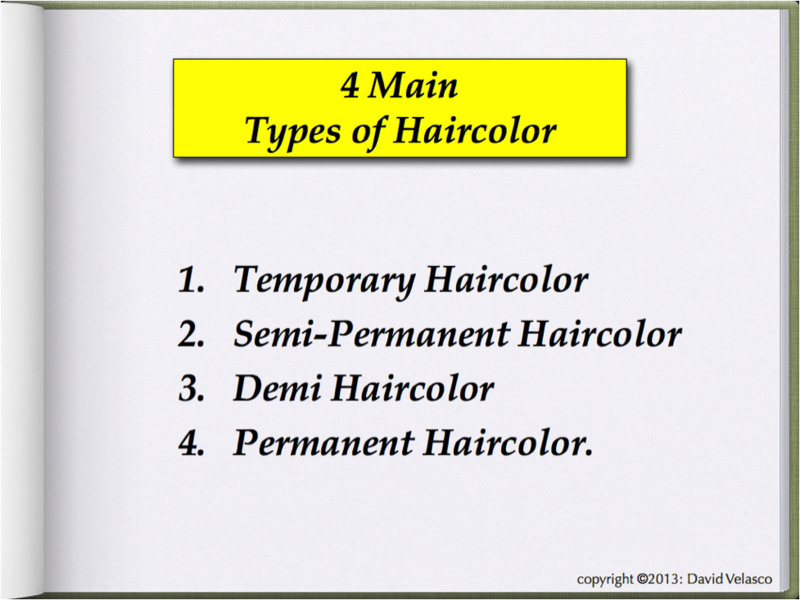 In today’s haircolor lesson I want to talk about the 4 Main Types of Haircolor. What they are and when to use each one. I say MAIN types because these are the main ones that we use in the salon every day. There are other more obscure types of haircolor like Henna, Polymer colors (think Cellophanes), colors made with Metallic Salts and of course so-called “Organic” Haircolor. Which will not be discussed here. (If you want info on these read my book “How Haircolor Really Works”. In the world of haircolor it is important to understand when and why to use a certain type of haircolor. So in this post, I’m going to break them down for you and give you the information you need to get the most out of your color line. One important thing to realize before we get started is that Semi-permanent haircolor is different than Demi-permanent haircolor. 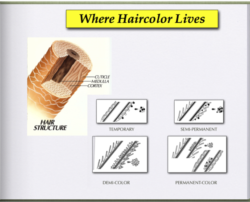 I know that many haircolor manufacturers do not distinguish from the two and that this has caused a lot of confusion in our industry, but as you will read in this post, you will learn how and why they are different. In the illustration above are 4 squares. 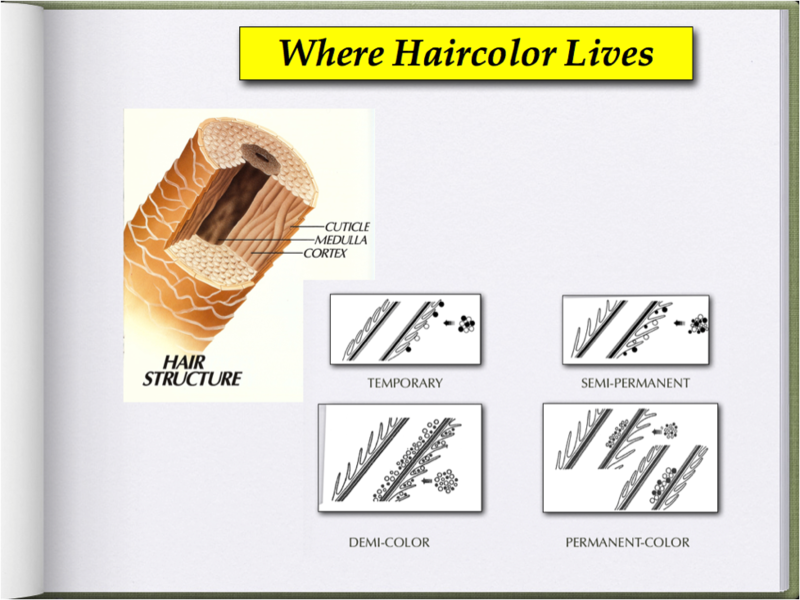 Each one shows you exactly where the haircolor molecules live inside the hair. Below we will look at these in more detail, but for now, I just want you to realize that even though there are 4 types of haircolor available to us, chances are you only carry 2 of the 4 in your salon, Demi & Permanent haircolor. The first one we’ll look at is called temporary haircolor. Think about Roux Fanciful® Rinses, and there are others. Color-enhancing shampoos, conditioners, color-enhancing gels and mousses that have color in them – these are all forms of temporary haircolor. These are made with what’s called pre-oxidized dye molecules. In other words, they’re not made with oxidative dye molecules; they’re made with dye molecules that have already been oxidized during the manufacturing process. Thus you do not need to mix them with any kind of developer. 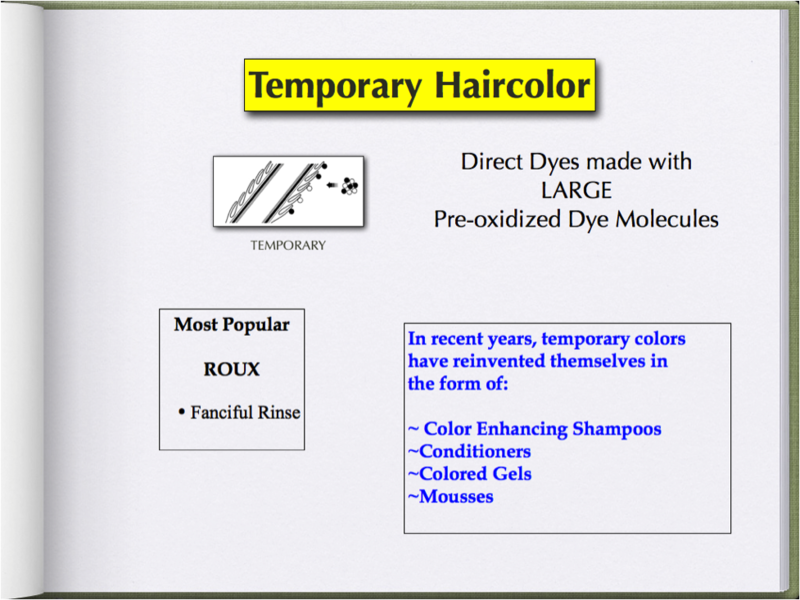 Temporary color has very large, pre-oxidized dye molecules. So when you apply it, the large dye molecules stick to the outer layer (cuticle) of the hair. In the illustration above, you can see the little ridges of the cuticle layer. The dye molecules for the temporary color are very large. Think of them as very large balls. They can only kind of stick onto the outer layer of the hair. Assuming the hair’s in good condition after one shampoo it’s going to be washed away completely. If the hair has been pre-bleached, or if the hair has been damaged in any way, like chemical relaxer or permanent wave, the cuticle layer has been lifted up or, in some cases torn away, temporary haircolor will go deeper into the hair shaft (cortex) and it will stain hair and not come out at all. Years ago, when I had a salon in New York, I had 2 clients who were both flight attendants, and they were roommates, one was a heavily-highlighted, blonde, with bleached highlights, The other one had her hair colored red. At that time, I sold a line of color-enhancing shampoos and conditioners. So, the blonde bought one for a blonde hair and the redhead bought one for redheads. Well, one day, while the blonde was taking a shower in their apartment, she saw the redhead’s products there, shampoos and conditioners, and she thought, “Hey, that’s like temporary color. It might be kind of cool to be a redhead for the day.” She thought it would be fun. So, she uses her roommate’s products, the Red shampoo and the conditioner, on her hair. When she finished and looked at her hair she freaked out. She thought her hair would be a beautiful red color like her roommates but instead, she looked like Ronald McDonald, a horrible, ugly red color. It was great for the redhead to keep her hair red. But when put on bleached hair, it looks totally different. Now, she washes her hair 5 or 6 times, to try to get this out, but it would not come out. So, she comes back to me in tears. I had to do a major color correction on her. The only way to get her back to blonde was to bleach it back out. It’s important to understand is that there is a difference between semi-permanent color and demi-permanent color. A lot of people don’t understand the difference, and a lot of product manufacturers have confused the issue because many times they bunch them together, and they should not be bunched together. 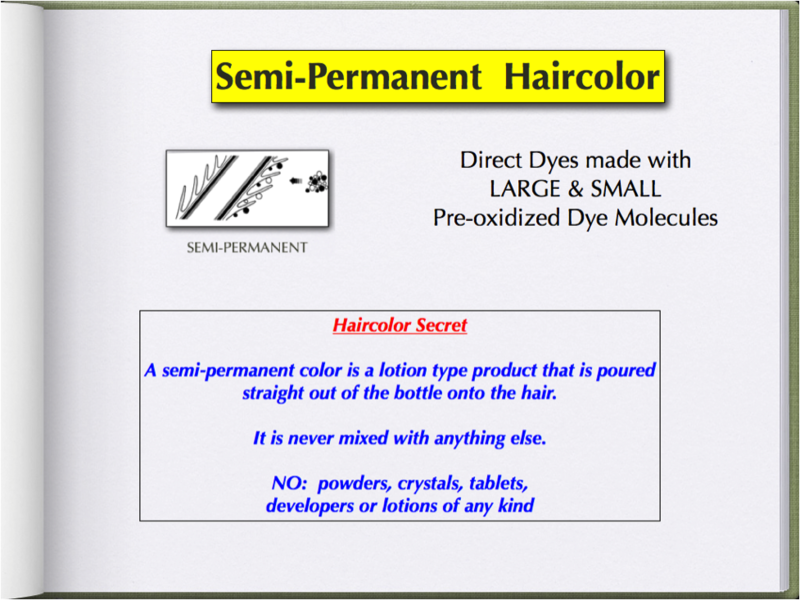 Semi-permanent haircolor has 2 types of dye molecules, the large pre-oxidized dye molecules, like temporary color, and it also has small pre-oxidized dye molecules and no developer is used with it. A true semi-permanent color is like a lotion-type product that is poured out of the bottle, straight onto the hair. Now, because of the fact that semi-permanent color has large pre-oxidized dye molecules and very small pre-oxidized dye molecules, there is better penetration of color in the hair than temporary color. What happens with this, typically, is the lotion is put on the hair, a plastic bag is put on their hair and they sit under the dryer for 15 or 20 minutes. The dryer swells the cuticle layer slightly and allows those little tiny dye molecules to penetrate under the cuticle layer a little bit. It still does not have the ability to go into the cortex, but it lodges into the cuticle layer. Therefore, when the hair is washed, the color doesn’t wash right out. Years ago, these colors were called 6-week rinses. This was because years ago, ladies just washed their hair once a week. Before the shampoo and blow-drying era, ladies would go to the hair salon or beauty parlors and have their hair done once a week. They would get a semi-permanent color, and it would last for about about 6 shampoos. But now, people wash their hair every day. Some people wash their hair twice a day. For example, if they are going to the gym or working out, they may wash their hair twice a day. So, again, these rinses wash out very quickly. And that’s why they’re not so popular as an in-salon service unless you are working primarily on an African-America clientele. Keep in mind that semi-permanent colors adhere to the outer layer of the hair. They still do not have the ability to go into the cortex of the hair (unless the hair has been pre-lightened or is very porous). And the reason for that is because there’s no catalyst. It is not mixed with any kind of lotion or peroxide. It goes straight out of the bottle into the hair. The third category is Demi-color. Demi-colors have only been around for about 20 years but they have emerged as one of our industries leading types of color. This is primarily because of the many ways they can be used. 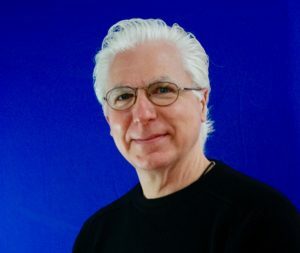 Demi-colors are very popular because they don’t change the hair dramatically, so they’re great for using on men, for example, because men don’t want a dramatic color change. They’re great on women, especially someone who’s never had color before since they are being introduced to color. It’s not so dramatic. Demi-colors are completely different than both, Semi-permanent & Permanent haircolor in that they are actually made with two different types of dye molecules. It’s this unique duel pigmenting system that gives demi-color its advantage over semi-permanent color, when it comes to gray coverage. Also because the developer is usually very weak, demi-colors will not lift the natural color and thus not create unwanted warm tones like permanent color can. 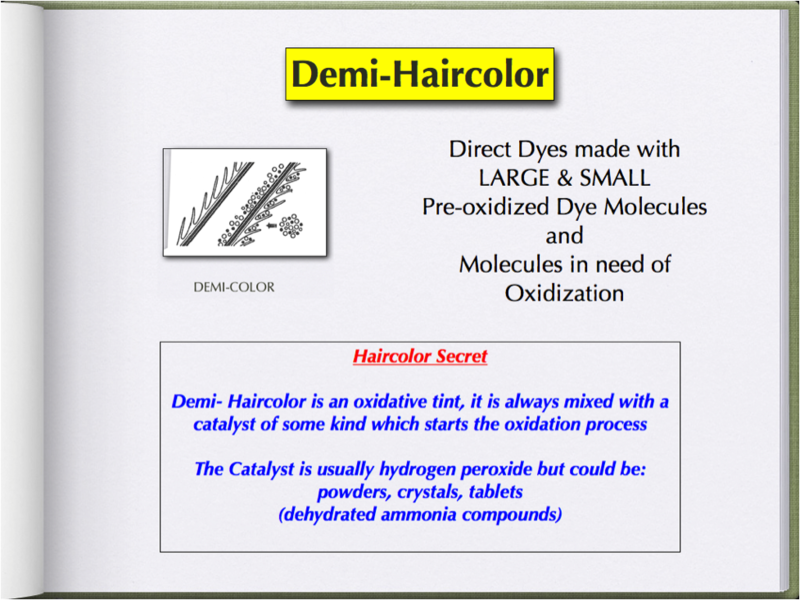 Demi-color has a combination of both dye molecules. It has the dye molecules of a semi-permanent color, that adheres to the outer layer of the hair, and it also has some of the dye molecules similar to permanent color, that actually penetrate the hair shaft, and goes slightly into the cortex of the hair. Although, like this illustration shows, it does not go as deeply into the cortex as permanent color does. It does go into the cortex a little. So, for example, if someone is a brunette and using permanent haircolor , when the color starts to fade, a lot of times the hair will start to look red. The brunettes will turn red. That’s because all permanent color works on the premise that it has to pre-lighten the natural color first before it injects the artificial color into the hair. But Demi-color doesn’t pre-lighten the hair at all. Demi-color is what is known as a progressive tint, which means it can only go progressively darker (not lighter). Demi-color will fade, but it will fade on tone. That brunette won’t go from brown to red; she will go from brown to a lighter shade of brown because there was no lifting action in the coloring process. What really fades on the demi colors are the large and small dye molecules that only adhere to the cuticle layer of the hair, just like semi-permanent color, and the ones that penetrate the hair shaft, like permanent color, stay there. So, if someone’s hair is colored with demi-color, even if she has gray hair, she will get good coverage and a line of demarcation. It has structurally changed the color of the hair, but not as strong or as permanently as permanent color. Traditionally, 20-volume peroxide is used with permanent color, On some occasions, 10 or 30 may be used, but traditionally 20-volume peroxide is used. Demi-colors use about 5-10-volume peroxide. BTW-In Volume 2 How Haircolor Really Works I list my top 10 ways to use demi-color. 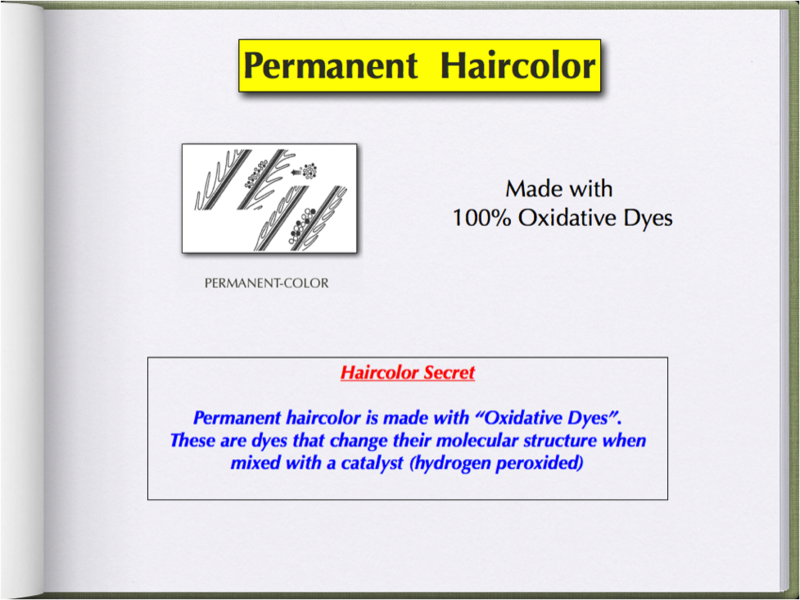 All Permanent haircolors have dye molecules that have to be oxidized. In other words, they have to have a catalyst that is usually hydrogen peroxide. Also, all permanent haircolor must have ammonia, the lighter the shade, the higher the ammonia content in the tube. The ammonia in the color and the hydrogen peroxide together create a series of combustion gasses. These gases create a few things that happen simultaneously. When you mix the developer (peroxide) with the color, the dye molecules start to grow. In other words, peroxide is H2O2. It’s hydrogenated water. It’s water with oxygen. When that oxygen comes together with the dye molecules and ammonia, it infuses oxygen into the dye molecules and makes the tiny, tiny dye molecules start to grow. Free ammonia is a strong gas that kick-starts the oxidation process. And, at the same time, it also kick-starts the swelling of the cuticle layer of the hair and the decolorizing of the natural pigment of the hair, The cuticle layer of hair has to swell some to allow those dye molecules to penetrate into the cortex of the hair. After a few minutes goes by, that strong ammonia smell will dissipate and calm down. That’s when the bound ammonia takes over. The job of the bound ammonia is to continue with the oxidation process throughout the length of the color processing time, usually 30 to 45 minutes, after which time the color will be too weak to do anything else. Here is a simplified summary of the oxidation process. What happens, in essence, is that color goes on the hair, the cuticle layer starts to swell, the tiny dye artificial molecules penetrate into the cuticle layer of the hair, and at the same time, it begins to decolorize the natural haircolor pigment. When the dye molecules are in the cortex they start to grow. They get bigger, and fatter until finally, they get so fat that they can’t come out of the same hole they went into. Imagine they’re all so fat, and they’re all holding hands. And now, the process is over 30 minutes later. The hair is shampooed, and the residual color that’s on the outside of the hair comes out, but the color that’s penetrated into the hair shaft stays in there permanently, hence the name: Permanent Haircolor! 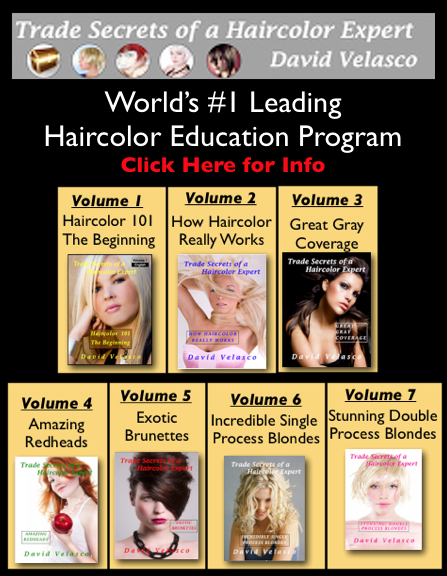 I hope you enjoyed reading this haircolor lesson, please leave a comment below. So, I use Goodwill color. They have “Coloranc” which I call my semi and Demi colors. When useing both, I have to mix with a special lotion, one called Coloranc lotion ( which I use for “color balancing, or safe intro to color) to make it a Semi permant and the other is mixed with Colorance “Plus” lotion which I understand, is to make the color a demi permeant. Y ou say that Semi is already to go, no mixing whith any thing. I am confused by this, and now not sure now if my semi is really a semi permant color. Is my understanding wrong about the colorance i am useing? While at the same time being easy to understand, this is probably the most perfectly correct and detailed explanation of the different types of color I have ever read! Love your education posts. They’re a great refresher. Really enjoy your educational posts. They are very informative and easy to understand. Thank you.